Its NOT a bad movie. Although I know I am going to say its not very original either. There is nothing new that you haven seen somewhere before. The story about 7 heroes (knights) protecting a village of defendless villagers. Marching behind them are a big bunch of bad guys that will kill and leave nobody alive. 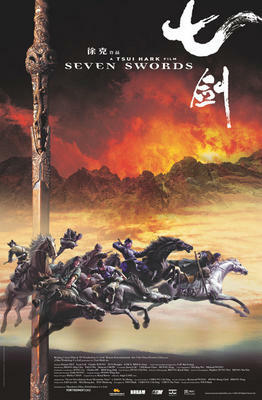 I haven't read the book by Liang Yi Sheng, but this plot however sound 70% similar to "King Arthur" last year. Xu Ke's fighting scene is something I must say I had always loved, especially back in the days with Cheng Xiao Dong also doing many of the martial arts movies few years back. Its still enjoyable in this one, but you probably saw some shadows of Kill Bill here and there. Swords slicing heads and legs in cicular fashion, long blades crashes in a tight long corridor... Sound familiar? Hei, but I dint say the stunts are not cool. Donnie Yen has always been my favorite. But I feel that this show is very unfocus in character development. OTher than Donnie Yen and Leon Lai, I do not even recall any other important characters. I also learn that there are at least 3 version out there. 120 minutes. 150 minutes and 4 Hours. Maybe the 4 Hours version is worth watching. I would getthis on DVD again I guess to watch all. It is just such a waste just because the cinema wouldn't play a 4 hours movie for the price of a 90 minutes one. Also right at the end, there is strong hint of a sequel. Like I said, I did not read the book so I do not know if the story actually ends here. But will this be Xu Ke's new Trilogy. Only time will tell.